Does your personal or organizational dream seem to be floating around in the recesses of your mind? Lack definition? Not yet reality? A dream typically has many threads that must come together in order for it to become reality. I help you identify those threads through the process of strengths-based analysis of your personal or organization’s LifeWork, routines you need to maximize, potential pitfalls and developing effective counter-measures. You and/or your leadership team will realize the skills and tools already at your disposal to enable you to weave your dream into reality. 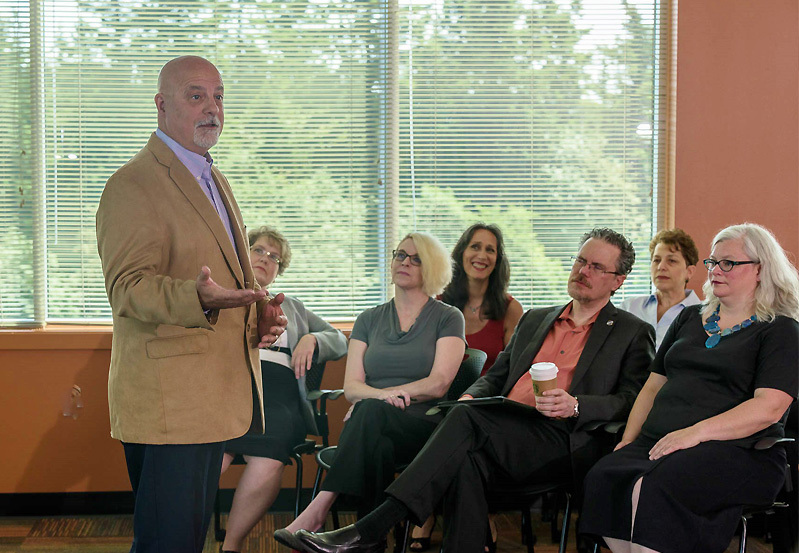 Richard began his coaching practice with the desire to help individuals and organizations define, develop, and become successful in their pursuit of their LifeWork. There is much written today about finding a work and life balance, unfortunately, most writers on this topic have it backward. We are all gifted in life with our own unique personalities, our own talents, and our own passion to accomplish something great in our lifetime. Hopefully, work falls in line with our lives. But often that is not the case. Rather than trying to find some sort of balance between two different “lives,” Richard’s Engaged LifeWork Method™ helps you to weave your work into the tapestry of your life. The tapestry of your life is made up of different threads of varying materials, textures, and sizes. Threads such as LikeWork, Service, History, Resources, Family, Faith, give an idea of some of the colors and textures I work with to help individuals and organizations to accomplish their goals, whether that is weaving a tapestry of career advancement, developing or enhancing organizational culture, becoming service oriented, or personal faith and life success. Each tapestry, individual or organizational, begins with a purpose. ZCS is committed to enable others in discerning their God-given purpose for this time in their life and train them to access the resources available to them in order for them to fulfill their purpose. ZCS basis all of its coaching and consultations on Biblical principles in order to be an effective steward of God’s provisions and to bring Him glory. This includes: Honesty, Integrity, Service, Discipline, Justice, and Stewardship. Richard Zielke is the creator of the Engaged LifeWork Method™. He began the process of weaving this tapestry together as an athletic coach training champion age-group swimmers and his son’s Little League baseball teams. Other threads include 20 years of ministry experience in Young Life and as a pastor, collegiate and post-graduate studies in Educational Leadership, as well as further graduate studies in Counseling, Leadership, Organizational Development, and Spiritual Direction. He is a recognized Trainer of Trainers and a Certified Professional Coach. He has served as Executive Director of a non-profit working with homeless families, as the Director of Career Services at two collegiate institutions and as the Executive Director of a local campus of an international education group. Richard enjoys hiking with his wife Patty, golfing when he gets a chance, building furniture, and reading. Richard and Patty live in Aloha, Oregon with their three-footed wonder dog Kami and cat Gracie.